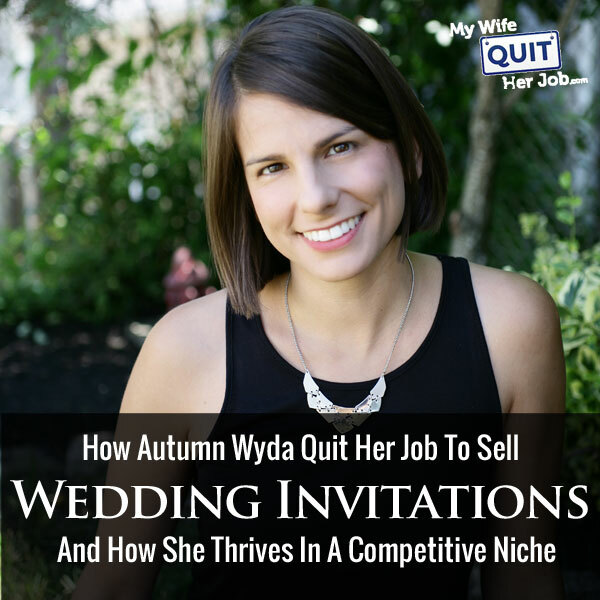 Autumn Wyda quit her job cold turkey in order to start Shine Wedding Invitations, a beautiful website that sells wedding invitations online. Now quitting her job took a lot of guts because she gave up her salary even though her business wasn’t making any money. But she had tremendous confidence in her abilities and today she runs a very successful online stationery shop that makes enough money that her husband quit his job too to join her. Autumn is a true entrepreneur she shares a lot of the strategies that she used to promote her shop in a very competitive niche. Enjoy! You are listening to the My Wife Quit Her Job podcast” where I bring in successful bootstrapped business owners to teach us what strategies are working and what strategies are not. Now this isn’t one of those podcasts where we bring in famous entrepreneurs simply to celebrate their success. Instead I have them take us back to the beginning and delve deeply into the exact strategies they used early on to gain traction for their businesses. If you enjoy this podcast please leave me a review on iTunes and enter my podcast contest where I’m giving away free one on one business consultations every single month. For more information go to www.mywifequitherjob.com/contest. And if you are interested in starting your own online business, be sure to sign up for my free six day mini course where I show you how my wife and I managed to make over 100k in profit in our first year of business. Go to www.mywifequitherjob.com for more information. Welcome to the My Wife Quit Her Job podcast. Today I have Autumn Wyda with us on the show. Now I actually didn’t know Autumn at all until she randomly entered my podcast contest and in the contest entry she wrote the following: Steve, I just wanted to take a minute and say thanks for putting yourself out there for blog and your podcast. I own Shine Wedding Invitations and I have been working in wedding ecommerce for the past 5 years. I just read your blog and just recently subscribed to your podcast. Both are fantastic. And she then went on to tell me you know how she quit her job in order to start her online business and that her husband recently quit too to kind of help her out with the business and that her husband recently quit too to kind of help her out with the business and this last line is the one that actually hooked me. She said, “If I can ever be of any help to your linens business please let me know. It looks like your website is ranking pretty well right now, but if a blog post and some back links would help you, I’m happy to put something together as a thank you providing such great information on your blog and your podcast. So here is what struck me about Autumn’s email. So one, her email caught my eye because we shared something in common, and two she didn’t ask for help but instead offered to help me out instead. So what did I do? I immediately went over to her website, checked it out, it’s awesome by the way and I immediately asked her for an interview just right then and there. So Autumn runs shineweddingsinvitations.com, which sells you guested wedding invitations. Now, wedding invitations is an extremely competitive niche. My wife and I ran a store in the wedding industry and its just a very competitive niche to begin with and you know what’s funny about this is that in my course that I teach on the side, I actually advise students to stay away from such related niches like Autumn’s. But she’s made it work really well and she makes enough money that both she and her husband quit their jobs. And with that I’m very impressed so without further ado, welcome to the show, Autumn, how are you today? Autumn: I’m great, thanks Steve. Steve: Yes, Autumn, so how did you come up with wedding invitations and give us a brief overview about what sets your invitations apart from the hundreds of other stationery shops out there. Autumn: Oh gosh, well just how I came up with the idea is basically, I had always wanted to run a business. And I worked in engineering for a long time and I kind of knew that I didn’t want that to be my career. I wanted to quit my job, start something on the side. I got into sales and that position gave me a lot of flexibility and time and I started reading some interesting books like the 4-Hour Work Week by Tim Ferriss and it was just total inspiration I just going and get something started. So I actually followed Tim’s book pretty closely, he had some homework sessions as the end of each chapter that asked you to brainstorm business ideas and make list, I did all of these things. And you know I had a list of dozens and dozens of ideas and I would just go through and kind of cross them out, or circle different ideas and of course the classic thing you know I was planning a wedding and I thought “Hey, wedding invitations, I can really do this”. I had a background in commercial printing, I was working in Kodak at the time and kind of in that industry so I knew about that and then I looked at the sites that we were going to purchase invitations from. And I certainly think that they were all that great and it is funny you are saying it is a very heavily saturated niche. We opened in 2008 under a different name at the time. And at that time honestly I looked at the sites and I thought a lot of them were dated. One of the biggest competitors today which I think you just interviewed Wedding Paper Divas, they actually only had 50 designs at that time and their site was one of the better sites and I thought, hey, the site is ranking well, they are advertising, clearly they are making money and they only had 50 designs I can get in on this. So while you know it is a saturated and competitive market I think even just a few short years ago really wasn’t that bad. And I saw an opportunity that I could possibly make money you know if other people were advertising and making money, I felt that I probably could too. Steve: That’s interesting because let’s see, we got married in 2003 and I think the first place we went to was just local stationery shops. I think we went to places like paper stores, we didn’t really think to look online actually. Autumn: Right, absolutely and that just really came about I mean I would say in the mid 2000 starting to get popular we were looking like I said a lot of stores just weren’t up-to-date, they didn’t have modern designs to choose from, and I really only saw one or two stores that did and that’s why I thought hey, this looks like an opportunity. Steve: Ah, okay so maybe I was just thinking in the present tense. Now, there’s lots of places that do wedding invitations, but I had to be honest with you know I actually looked at your site along with my wife and your invitations do look very classy, much more elegant than some of the other competitors out there. So I can completely tell why you are successful. Autumn: Awesome, thank you so much. Yeah, and it’s funny because I kind of started off on a different path. I kind of focused on the lower mid market price point and we kind of had just we didn’t even take photographs if you look on our site we actually photographed the product against a white background and before I was just taking design screenshots and a lot of sites were doing the same thing. And our designs just weren’t that great, they are more on the modern side, and as we went along I saw it was selling. And it wasn’t the modern designs; it was all of our classy designs. So I thought, hmm, this website is selling this is what I need to make more of so instead of adding to that site I decided to branch out and you know test a different market segment and test different designs and we actually did that on Etsy. And immediately the Etsy store just totally took off, and I could see that this is what people wanted and this was an opportunity in the market that you know wasn’t being met. There was a need that wasn’t being met, and so that’s kind of where I started to focus our store and our designs and I think that’s what has made us successful. Steve: Okay, so let’s talk about that it sounds like you have tested the market on Etsy. But there is actually a lot of different factors that kind of come into play based on you know people who sell on Etsy. For example, I know for a fact that Etsy have changed their algorithm through visibility several times over the course of the last 5 years or so. So, was there anything special you did to drive traffic to Etsy shops to test the market or you just let the Etsy search engine to do its own thing? Autumn: Oh gosh, yes things did change so back when I started my Shine Etsy Store, they were doing like eBay is doing, so they would put the most recently listed items first, and we were constantly at the top and I actually had my husband who is a pretty good [Inaudible] [00:07:39] bring in little algorithm that would constantly push the listings. So we would just pop up at the top. We’d sell something we pop back up, we sell something we pop back up and you know we would sell the same item over and over and over again the same day, it was awesome. So I kind of heard a little bit of a [Inaudible] [00:07:54] right there but even after they changed their algorithm, we continued to do well. And honestly I just think it was the products themselves and the product photos that made us successful there. Steve: Okay, so walk me through how this whole process works because I remember, I still remember actually when we got our wedding invitations done locally at the store, and it was just this long drawn out process. How do you guys handle order fulfillment and kind of how does your business model work? Autumn: Right, so we kind of handle all the ecommerce and the design. So somebody comes to our site and they place their order and they actually just fill out a form. And they don’t get to see a live preview like many other wedding sites. And just to note on that funny budding entrepreneurs when I first started my site had an online personalizer where you could actually see your wording and how your invitation was going to look. And I was so completely set on the idea that my customers absolutely had to have this great technology where they could see what they were going to get otherwise they were not going to buy. So I spent all this money on a custom website that I had made overseas, I’d outsourced it and that first business kind of failed and it was because the designs just weren’t what people wanted. So then I moved the Shine where you just fill out this form on a website. So I just wanted to make the point that you know you may think that your customers need this fancy technology but it’s more about the product and that’s what I found. So we actually have a really simple process where they just go online enter the wording and then one of our designers actually puts it into our software, lays everything out, makes it beautiful. We send the customer an email with their proofs, their PDF’s and then once they are all good to go they actually get some to print through our printing partner filled that way. Steve: Okay. So one question I had in my mind actually was you mentioned that you had all the software to give your customer the live preview of the invitation. Do you think that failed because the live preview just didn’t look as nice as what your designer’s could put together themselves, or was it just because you had completely different designs back then? Autumn: I think that was part of it. I think that you know our designs had some elements when you really do need that human touch and the eye to do it correctly. I mean also I think our customers just didn’t want to deal with that, they didn’t want to sit on a computer for an hour and a half and move around lines of type. You know we are catering to like the made and high end market, and I think they just want to add another wording in and leave it up to a professional. And so it works out for us because the online personalization software was kind of a bear and it just had so many bugs and you still had the designer proof anyways, so it’s kind of nice, I mean when I started my second store Shine, we actually started on a 40 dollar WordPress template and we’ve taken in hundreds of thousands of normal sales through our 40 dollar template, so it can be done. So you don’t necessarily need crazy technology to do well and be successful. Steve: And they are going to be glitches where the photo doesn’t pop up sometimes, and so I just kind of dropped that idea altogether . It’s good to know that your experience was it didn’t actually really help complete the sales so. Autumn: Yeah, it gave us some experience, you are probably totally fine (laughter). Steve: So you know one trend that I have been actually noticing with a lot of other people that I have been interviewing is that people have chosen to do many more– I don’t want to say the word ‘manual’ but people have been just taking that extra mile to really take care of the customers. So like you said, since you sign up and you place an order you actually get assigned a real human designer. And how much of that has– you know how did you kind of juggle scalability versus the personal human touch with your business? Autumn: Right, so when we initially thought of this idea and started it I mean we wanted it completely automated it. I’m all about automation, I love watching how it’s made on the discovery channel. I can’t see anyone they have human process it drives me nuts. But for our business it just turned out that you really did need someone there personalizing the invitations. And it’s actually not that bad, you know we had several employees and the company is totally virtual, so everybody works from home. So it’s not like we had to rent space and you know get a big building and pay all these bills everyone is still just been working from laptops. So while human is in there we have it set up in a way that it’s actually so pretty efficient. Steve: Okay, in terms of your designs do you actually design them yourself, or the designers just constantly channel out designs on their own? Autumn: I did design the initial 40 or 50 designs and we have additional designs now and my employees definitely contributes so its kind of a group effort, and that’s one of the fun things that we get to do, we don’t often see each other since we are all virtual but you know once every Fall we get together and try to put together you know 15 to 20 new designs. So that’s kind of a fun part of it. So yes, I definitely hire my people based on their design skills and they definitely contribute. Steve: So are all these people full time employees or do you just kind of pay them as business comes in? Autumn: They are full time yes and we definitely need them full time as well so. Steve: And so how does the fulfillment work, so you don’t have an office space from what I understand, is that correct? Autumn: Correct, so we have a printing partner, and they’ve actually shared part of their space for us so we have like a little bit of access to a room there. Steve: I see and so how does that deal work out in terms– like how did you approach them in regards to just becoming partners for your business in the very beginning? Autumn: Right, so basically I had just called all over town. I had called numerous commercial printers asking if they did short run and many printers aren’t set up for short run and they wanted to do like thousands and thousands of prints. So once I found a few digital printers that were able to do short run I evaluated a few and looked at you know chose a few different that passed out. And really I had two partners and I went down to one. And one thing was the envelope printing we had a heck of a time finding someone to print envelopes. Nobody wanted to do it and I must have called I can’t even tell you like 60 or 70 places just asking if they printed envelopes. And finally somebody bid and they gave me an excellent price and that’s who our partners today. Steve: Interesting. So do you guys– in the very beginning did you have any sort of deals in place or was it just straight here is the business I will pay you full price in the beginning, and then we will just from there? Autumn: Right so, I mean I didn’t get definite wholesale pricing from the get-go but I promised everybody that I would grow. And our current printer I told him that you know look, just give me a chance and I promise I will become your number one customer and we have become his number one customer. So you know that was great for him and also great for me because by committing to that and you know just giving that verbal agreement it kind of made me get off my bar and make sure that I went out and got the business and did fulfill my promise to him. Steve: Okay, so let’s talk a little bit about just the industry in general. So I mentioned it earlier that you know it is a pretty competitive niche. So how did you actually get customers in the door earlier on? Autumn: Right so, we did a lot of advertising through blogs, AdWords, Facebook and the thing with that is it just constantly changes from year to year. Every year one place for traffic is really expensive and a new one comes up it gets really cheap. So I kind of always just looked at the numbers and tried to find cheap traffic, and I was able to do that successfully. And then I did mention Etsy earlier you know we are kind of like going along with our business and then we decided to test Shine on Etsy. And the reason I did that is because I was having another stationery colleague and she had a pretty successful store as well, we were kind of trading information and she mentioned that Etsy was 40% of her sales and I was just absolutely blown away. That’s why I decided to give that market place a try, and I was a little concerned that you know maybe if you were on Etsy, you wouldn’t be taken as seriously kind like an eBay store which is a full flagged website but it turns out that’s where customers are shopping. And if your audience is there, you might as well sell there. So I decided to give it a chance and that was really great way to test pretty much no cost. And it showed that my product would be successful and then from there we went and built a website. Steve: So today do you still have that Etsy shop up? Autumn: Yeah, we definitely do and we still generate a lot of sales through it. For wedding Etsy is huge. So we have to kind of stay there. Steve: So in terms of once you get an Etsy customer, do you actually provide incentives to shop on your real sites or doesn’t really even matter to you. Steve: But you are allowed to include marketing collateral once you make the delivery right? Autumn: Yeah, that’s correct. Then it’s up to the customer’s choice if they want to place a follow up order on our website or Etsy. Steve: Okay. So you mention a whole bunch of things. So you mentioned blog advertising, AdWords, Facebook and that sort of thing. So, let’s just kind of go through each one because I am curious myself. So blog advertising– so which blogs did you target, and how did those ads perform for you. Autumn: Right so, I tried to just focus on the large wedding blogs at the time. And the biggest one was Style Me Pretty, that’s kind of where I made the largest investment and that definitely has paid off. We run advertising with them, they do a great job and we have just gone through lots of different blogs through the years and some work some don’t, you know we’ll commence for a few months or a year and then pull out if it’s not really performing. And it is a little bit hard to tell on our niche just because we sell– a cycle is so long, so often times the bride will be looking for her wedding invitations eight to twelve months before she actually places the order. So you can’t always tell from Google analytics where the sale is coming from and you can make a good guess. So I kind of just evaluate what’s performing well and make marketing decisions based on that. Steve: You know what’s funny is you mention that it’s a long sales cycle. For us it’s actually the opposite. So invitations are a necessary thing for a wedding, whereas our products are just kind of like an after thought. Steve: So, we actually have people call us like the week before. Sometimes there’ve been people who called us two days before their wedding wanting our handkerchiefs, so it’s a little bit different. I’m just curious though, so let’s talk about Style Me Pretty so did you buy like a side bar ad or a post or you know what type of bar did you buy. Autumn: So we set it up this side bar ad and then we’ve done posts with them which are really successful, and we’ve done the same on other wedding blogs. Steve: Okay, and so how is the arrangement– so what works better the side bar or the post or? Autumn: You know a little bit of both. I mean they are both great. The only thing I found recently is that I think a lot of our audience is moving over the Pinterest so– I don’t know– are you aware of Pinterest or you, definitely. Steve: Absolutely, Pinterest is awesome. Anyway go on, yeah. Autumn: Yeah, so we found that over the years it seems like our audience is moving away from blogs and actually doing more of their shopping and looking and planning on Pinterest. So we’ve kind of you know migrated a little bit from spending as much money on the blogs, and actually doing our own work on Pinterest. Steve: Okay, and let’s talk about that. So what are some of the things that you do on Pinterest? Autumn: So we definitely tried you know paint on our own boards. We do work with other people to kind of promote pens and get our pens out there to larger audiences. But you know it’s just painting a little bit every day does make a difference, and we also have a company blog where we you know show our invitations in different colors. And so everyday we are photographing new things and posting things there and then we show on Pinterest. So it’s kind of like a combination of things that you do along in those channels that can actually get more visitors. Steve: So I’m just curious. You mentioned you have a blog. So how does the blog kind of come into the entire strategy of bringing customers to your shop? Do you find that you got a lot of blog visitors who find you through the blog and then go on to buy your wedding invitations? Autumn: Definitely, our blog is one of our biggest referrals now, and I absolutely love it and I definitely recommend blogging to any entrepreneur just because you know if you are paying for lets say a side bar tile on a blog like a wedding blog. You are paying for that side bar tile but then at the end of the year you have to pay again if you want it to continue to be there. Whereas when you blog you know you invest that time or money right upfront, you make your blog post and it’s there forever and you know Google indexes it and its there forever so you’re going to continually get traffic basically for free after you have put in the initial work. And you know a lot of companies will blog about you know ideas or inspiration we kind of focus right on our products, I mean we know people are searching for wedding invitations in different colors and styles. So we do blog posts on invitations in different colors and styles. And you know some people may say that’s pimping your product a little too much but it really does work for us. So that’s what we are going to continue to do. Steve: I can tell you why it works for you Autumn, its because your photos are awesome. Autumn: Oh thank you so much [laughter]. Steve: Because I know for a fact, I look around wedding blogs out there and a lot of times it’s just a collection of pictures. I don’t know if you’ve noticed the same thing. Steve: Very little text so the pictures is really what draws the people to a wedding blog and I think that since your pictures are so good naturally people just naturally gravitate there, and I’m sure you sell a lot through it. So it’s kind of a rhetorical question that I just asked you [laughter]. So do you do anything to promote your blog post at all or is it just straight you post and that’s it? Autumn: We just post. And you know sometimes we mention on our Facebook but people are just finding us organically through the blog post. Steve: So just curious in regard to your photography. Do you– are you a photographer yourself or did you hire somebody. Autumn: Well in school I did minor in photography, I’ve had a passion for it since I was in high school, so I do take my own photographs. I’m glad you like them but you know I really think they could be better, but that’s just my own self criticism– my own perfectionism coming into play. So, I do have a little studio south of my house with a white background and I just photograph right there in the spare bedroom. Steve: So that certainly helps out a lot that department. You know our photos admittedly aren’t that great, but they are doing the job right now but you know at some point we want to invest in some more professional photography I don’t know. So what was I going to ask you next, oh yes, AdWords. So have you had success with AdWords because I imagine those key words are really expensive to purchase. Autumn: They are really expensive. And four or five years ago I did a lot more of it and I’m just doing barely any today. I don’t focus a lot because it is rather expensive and you know there is only a certain amount we can spend per customer to make an order profitable for us. Steve: Yeah, I guess the difference between the wedding industries is like hopefully people are only getting married once, and so there is no like lifetime value with the wedding customer per se right unless they get divorced [laughter]. Autumn: Right, yeah and they can come back for programs and place cards and they have accessories. But you know not everybody does so we definitely have a certain value for each customer, and we just can’t exceed a certain marketing budget for them. Steve: Okay. And what are your experiences with Facebook advertising? Autumn: Up and down, so again same thing four or five years ago I was doing so much on Facebook. I mean I was getting clicks for like 10 and 15 cents it was just awesome, and they were converting. It was great and then you know over the years Facebook changed and it was just not working at all, so I completely stopped and then just recently with the news feed ads which changed, and we’ve tried that again and we were seeing some success but they can get expensive as well. So I’ve just kind of been playing around to see what pictures have the best conversions, and then and the best clicks through rates, but it is nice because they can see a picture of the product upfront through the AdWords but they don’t see a picture. So you know if they see the picture and they click you already know that that lead is more qualified than let’s say someone clicking from AdWords where they’re just clicking on text. So I do think that Facebook is a little more successful in that way. Steve: So I was going to ask you so do you just send them to your product landing page or do you have like a sign up form with the Facebook ads? Autumn: I do send them right into our website, and then we have been doing free samples of our wedding invitations so we kind of mention that in the ads as well, and we see a lot of conversion from that. Steve: Okay, and then do you kind of try to grab an email address at that point or is it just customer engagement when they sign up for free samples? Autumn: Just the customer you know from the free sample. Yes we don’t do a ton with email. Yeah, I kind of mad at myself for that I need to get on it, but you know being small you can only do so much. Steve: No, yeah no, I totally understand. I was just trying to understand you know all the different avenues that you use. So out of everything what is working the best for you right now? Autumn: I would say probably Pinterest and just doing our own blog post. It’s the cheapest and therefore I mean its kind of the best ROI. Steve: Do you invest in SEO at all or it is just from your blog’s natural SEO? Autumn: Basically the blog’s natural SEO you know years back I’d done some reading and I tried to incorporate some SEO on our site, but we can always be better. We are ranking pretty well for some key words, but it’s hard to gain that system so we kind of that just figure let’s just make a lot of nice looking blog posts with some decent key words and see what happens because its not worth obsessing over. Steve: You know it sounds like you are doing the right thing because you mentioned that you are creating your blog post based on what people are searching for, so you are choosing probably multi word phrases that you know like blue wedding invitations with birds on it or something like that, right? Steve: You are more likely to rank with that than you are if you were just trying to target the wedding invitations by itself. Autumn: Right, even though that would be the absolute best keyword to have, but we are doing pretty well there but we are not on the first page yet [laughter]. Steve: Well, I can imagine that wedding invitations in itself is a very hard keyword to rank for. So, okay let’s see what else was I going to talk about. Okay, so what would you say is your primary source of customers today, is it word of mouth or is it just through these other sources? Autumn: You know it’s a really huge mix just between Pinterest, organic through the blog, regular organic search results, the wedding blogs. I can’t really pin point one thing, but pretty equally distributed which makes me feel good because then if one area starts to drop your whole business isn’t going into the tank. So I think definitely diversifying your traffic is a good strategy. Steve: Okay and I also noticed on your site you have actually got a ton of press coverage for your products. How did you manage to get in the magazines and get the press coverage that you have gotten and so far? Autumn: Honestly I wish I could say I had a certain strategy but it’s been more luck, just you know editors seeing our things and you know requesting samples and putting them on the magazines. So you know I would like to have a strategy in place where I did reach out to these people but it can be difficult to get the names and addresses of editors. So right now we just kind of put our stuff out there on our blog and at the Pinterest and that’s how we get contacted. Steve: Okay I mean incidentally that’s the same way we’ve gotten in magazines and that’s– you just get randomly contacted and then and they are like “can you send me something?” I’m like yeah, I’ll send you everything I have, whatever you want. Steve: So have you actually– I would be curious also to have you seen significant uptakes and sales whenever you get featured in a magazine? Autumn: You know I will be honest, I actually haven’t. We even did a full page national advertisement in the knot magazine which goes out to– it was like 330,000 households and issues and we just didn’t see a huge return on that. So I’ve just decided the key part of our business is much online as possible. That’s where we excel, and that’s where our audience is really shopping. Steve: Okay, you know just to share some of our experiences. Our magazine features have been kind of hit or miss. So believe it or not, so when we were brides and Martha Stewart weddings that actually didn’t generate that many sales. Then we got featured in like Country Living and this magazine called House Beautiful then all of a sudden you know a lot of people started buying those products featured in those magazines, so there was definitely a correlation like so one day I think we sold like 5 or 6 ex what we normally sell that particular product so clearly its weird but certain magazines even the smaller ones especially seem to be doing better for us. Steve: And you probably heard about our today’s show parents so that was ridiculous like if we get on the today’s show it just blows up traffic, I don’t know. Autumn: Wow, I can imagine. Steve: All right, so it sounds like you are pretty talented in yourself. You are able to do these photos, you can design your own cards and that sort of thing. So if someone wanted to start something similar to what you do, would there be any advice like if I wanted to start a wedding invitations company– not that I would because you would crush me, but what advice would you give me? Autumn: Well you know I actually didn’t start out doing everything myself, so initially I had outsourced a website design overseas, I had outsourced all the invitation designs to someone in Texas and another one in Canada and I actually used Elance and 99Designs so you know it can be done. You don’t actually have the skills, it was just that I also happen to have a passion for photography. So I decided to give it a start myself after I saw what was performing well and what wasn’t. And that just kind of worked for me because I chose a niche where I did enjoy doing the work that was related to the actual products. So my advice would be that you can outsource a lot of things and it can work just as well. Autumn: Right, and I think I had found that may have been later on. But I think I had found you know designers that way, so I may have started a contest and then actually just reached out to someone individually and formed a contract with them. I can’t exactly remember it’s a while ago. Steve: Oh no, that’s okay and then what was your experience with Elance? Autumn: Elance, it was interesting I will say that we worked with a company in India and the cultural barrier was just huge. There were just a lot of different expectations, so if you can find someone in the US I think you’d a lot better off, or just use you know a free resource like I said our current site was actually based on word press and it was a 40 dollar template so again you don’t need to have technical expertise. I can only coat a tiny bit of each channel on CSS. So really I downloaded a template and changed the colors and started selling immediately. It was only later that my husband really started to help. Steve: So what platform are you on now, are you still on word press? Autumn: Yes we are, so caught we kind of grandfathered into this 40 dollar template but you know we have made tons of modifications to it. So we kind of own it right now and you know we are looking at redesigning it maybe in the next year or two. But really I mean we are doing tons of sales through it so you don’t have to be that sophisticated. Steve: So Autumn I just thought I would share with you my experience as well so we are actually running a shopping cart that’s really antiquated but you know it works, right? Steve: It, doesn’t matter what platform you are as long as you are making sales it’s all good. So one mistake that I notice that a lot of people make is they want to switch to the most modern platform but in doing the transition they screw up and sometimes they completely screw up their SEO rankings. Autumn: Right and we– that’s one thing we talk about all the time. We love to transition to something that just makes our back ends smoother and makes updates easier but you just don’t want to risk messing up a good thing. Steve: Yes, so I thought I would ask you a little bit about this. So you mentioned that your site makes more money now and your husband actually quit his job to help you out. Since this is something that I’ve been kind of struggling with myself. You know what was the decision making process for him and quitting his job to join you? Autumn: Right, so basically he was really unhappy at his job and you know there are a lot of layoffs going around we were just waiting for the other shoot to drop and we just said you know what, let’s just make this decision, let’s just do it and it’s been great. You know we love being home together. It can be a little grading at times and there can be some arguments for sure I mean we see each other 24/7. But it’s nice, I mean you know he doesn’t have to put up with his creeper job anymore, and you know we make plenty of money to cover both of our salaries. So I mean it can be stressful because it is a business so you don’t have that solid pay check coming in for the rest of your life but you know once you are doing pretty well, there is not a whole lot of risk like you know you are sacked so. Steve: Yeah, actually that’s one of the things that I tell would be entrepreneurs you know once you’ve been in business for several years, it’s actually pretty stable. Like I can project the revenue, like my wife can predict– I shouldn’t say me my wife does all the finances, but she can predict the revenue you know for next quarter within you know plus or minus 10% pretty consistently. So it’s not like it’s this random thing where you experience a certain crush or you know of course it can happen but most likely it’s not going to. Autumn: Right and one scary thing is we will have a slow week or sometimes a slow two weeks, but then the next two weeks after that are absolutely insane. So it is kind of annoying how you know there can be lows and highs but over time it evens out and you just get used to it. Steve: So I’m curious too, since it sounds like we have a lot of parallels, your husband is an engineer I’m an engineer. I know for a fact that when I work with my wife on our business together and I only do it on the side not full time, we actually end up fighting over a lot of things. So how do you kind of keep the business stuff separate and not get into these arguments about the direction of the company? Autumn: I’ll be honest we’re still learning. Autumn: Yeah, there can definitely be a lot of arguments and I know just enough technical stuff to be really annoying and he knows way more than me so he gets super annoyed with me. I mean, we get into like a lot of brawls, but at the end of the day its just work and you just have to put your marriage first. Steve: Okay, that’s much easier said than done. Autumn: It’s much easier said than done [laughter]. So yeah we are still learning and we are still getting through it, but I won’t trade the business for the world. I do a lot of it and I think he enjoys it too. So it’s much better than a day job even with all of its faults, much better than a day job. Steve: Yeah, just– I thought I just share this also. So one thing that my wife and I do is now we just completely split up the work to the point where we are not overlapping at all, and she just rules the roast in terms of you know running the business the day to day, and I kind of work more on the marketing and the tech side so at least that’s how we’ve minimized the arguments. Autumn: Yeah, definitely and he does mostly only coating. So that keeps things separate as well. Steve: Okay, so you are putting him in a cubicle and just throwing him some pizzas every now and then right. Autumn: Well that’s a key side that I do, I don’t think I do [laughter]. Steve: Yeah, it’s funny because my wife occasionally comes up to me, she says, ‘I need this feature, this feature, this feature and this feature. And I’m like that’s a lot of work that will take me like the next couple of months to do it. Autumn: Well that’s what he says and then it’s magically done in three weeks after a lot of mourning and groaning so I don’t know [laughter]. Steve: So I have to make a note that you and my wife should not talk because I think if you compare notes it would be kind of scary. Autumn: Oh God, you should totally talk to my husband, I’m sure you guys will conspire on a lot of things because you vent, get your stress out [laughter]. Steve: So you mentioned that you like the 4-Hour work week, were there any other books that kind of influenced you to take this leap of entrepreneurship. Autumn: You know I did read a lot of ‘Rich Dad Poor Dad’ and then I really got into Tim Ferriss “The 4-Hour Work Week” and that book really– that was really my jumping up point. That just got me so pumped and I would say you kind of have to be a little bit insane to start a business because you’ve got to totally shut out all the naysayers, all the negativity, all the skeptics and you’ve got to focus and put in just a ton of work upfront, and take a lot of risks. So you’ve got to be kind of crazy to really start something and that book just really inspired me, just put me in the right state of mind, and I was able to just get all that work done upfront when it was needed. Steve: Did you quit your job first, or did you work on your business while working full time? Autumn: So at the time I was working as a sales rep. So I had a flexible schedule and I really wasn’t working all day, it was kind of nice. So I had plenty of time to do a little bit of leg work. So I’d say I worked on the business for about 5 or 6 months, and then I just started on quit and my husband supported me in this decision because I really wasn’t happy in my job as well, and I had no revenue at that point. Steve: Oh you quit with no revenue? Autumn: Yeah, I quit and I pretty much launched the site that day and we had the first sale the following week and you know I made a small amount of money the first year almost replaced my salary. I would say about like 60% but it wasn’t enough to really say it was a huge success, but then from there you know things kind of changed, Shine launched and then things just went really well from that point. Steve: Just real quick tell me about that first sale where did it come from? Autumn: That first sale, I am not sure where it came from [laughter] to be honest. I think it was just a direct hit in Google analytics, and it was funny because we were selling wedding invitations and our first sale somebody used our wedding invitation template for an engagement party invitation. So they didn’t order the response cards, they didn’t order anything else it was a tiny little sale and I kind of got really worried. I am like we– our first sale isn’t even a wedding invitation oh boy [laughter]. Steve: Okay, that’s really interesting. I was just curious because I remember my first sale as well, it was just this random guy who found us through AdWords and just bought something for like 20 bucks but I was ecstatic. Steve: Yeah, yeah so you are definitely more bold than I am like I wasn’t going to let my wife quit until you know we recently exceeded her salary with our business, and fortunately we did so she was able to quit but… All right Autumn you know we’ve been talking for quite a while now, I don’t want to take up too much of your time because you got a business to run. If anyone has any questions about this podcast where can they find you online? Autumn: Yeah, you can reach out at autumn@shineweddinginvitations.com and then feel free to check out our site shineweddinginvitations.com . Steve: Awesome, I will be sure to plug all of your stuff in the show notes because I do sincerely believe that your invitations are awesome and they are among the best ones that I’ve seen so far out there. If we were getting married again, we’d probably use you. Autumn: Awesome, thanks so much it’s been great. Steve: All right thanks a lot for your time Autumn. If there is one thing about interviewing successful boot strapped entrepreneurs is that they simply find ways to get things done without a large upfront investment. Now Autumn got started with just a 40 dollar template for WordPress and then she decide to take on Adhorn and Tiny prints who I actually interviewed in a previous episode. Now Autumn makes a lot of money selling stationery, and it’s all because of her hustle and her emphasis on testing before investing. For more information about this episode go to mywifequitherjob.com/episode26, and also if you enjoyed listening to this podcast please go to iTunes, search for the My Wife Quit Her Job podcast and leave me a review. When you write me a review, it not only makes me feel proud but it also helps keep this podcast up in the ranks so other people can use this information, and find the show more easily, and get awesome business advice from my guests. It’s also the best way to support the show and please tell your friends because the greatest compliment that you can give me is to provide a referral to someone else either in person or to share it on the web. And as an added incentive, I’m also giving away free business consultations to one lucky winner a month. For more information, go to mywifequitherjob.com/contest. And if you are interested in starting your own online business, be sure to sign up for my free six day mini course, where I show you how my wife and I managed to make over 100k in profit in our first year of business. Go to www.mywifequitherjob.com for more information and thanks for listening. I stumbled across this podcast by chance, I can’t remember what I was trying to search for but I’m glad I found you. I’m trying to build up my small wedding invitation business and this interview was very helpful! I can’t wait to hear other podcasts…. I came across this podcast at a time where I have been doubting my business and figuring out how to push it to the next level after 3 years. This was absolutely amazing to listen to and cannot thank you enough for it! Great job! hello, i have a website happyinvitation.com sells wedding invitations, and it is almost 3 years now, but i didn’t get orders, i am considering if invitations template on my website are not popular now,is it out of trends?